You know how easy it is to buy stuff online. Go to any of the online vendors, enter your card info and click buy. But to sell something—now that’s a whole different story. Besides, there’re only a handful of popular and dependable sites like eBay or Craigslist. The whole process is definitely much harder, just like making money is not as fun as spending it. 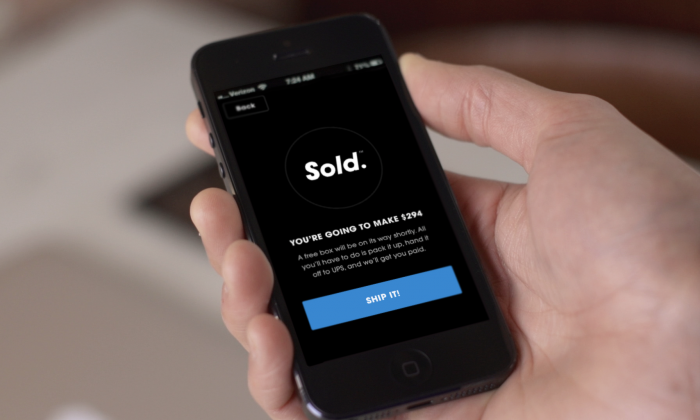 Well, that’s all about to change with the new “Sold.” app. According to the website, Sold. first helps determine the correct price for your item. Then, they sell it for you. Selling, of course, depends on the demand for the product, with their website claiming popular items getting sold within an hour of posting it. When the item is sold, you’ll get a black Sold. box (usually by Fedex) to pack it and send it off to the buyer. Your account will get credited (or they’ll send you a check) once the item has been received. Sold. basically acts as broker for the transaction. And as all good brokers, they get paid. Using an opaque, dynamic pricing model, you won’t know how much they make per sale. Anyways, does that matter? What matters is that the app offers considerable convenience to would-be sellers daunted by the whole prospect of selling and using usual methods of auctioning. They make it easier and they take their cut for that. Forget listing and communicating with buyers. Sold. does all that for you. Now, you can’t use Sold. for just any products like that old desk or mom’s jewelry. Fast-moving electronic goods and branded products are preferred. They’re easier to set a price and get a buyer. Besides, everything needs to fit in one of the three “pre-paid, pre-addressed and tracked” Sold. boxes, with the smallest box measuring 4x6x8 inches and the largest one 16x16x12 inches. For the rest, it’s sadly back to eBay. So, are you sold on this app? Sold is available both for iOS and Android. Check out their website here.